Is the Universe Expanding or is it an illusion? Is the universe expanding from a Big Bang or is it a misinterpretation of the redshift of light? The Big Bang and the expanding universe probably are illusions that fit the progressive agenda of an ever evolving universe. It also closes the door on the infinite series of cause and effect that requires a first cause outside the system to get it started, aka God/ creator/ overarching, pre-existing force. If time itself began with the Big Bang, there can be no “before,” thus cutting off any consideration of a first cause. 2.) One of many solutions to Einstein’s field equations that favored an expanding universe. Einstein’s own solution included a cosmological constant that resulted in a non-expanding universe. 3.) The Cosmic Microwave Background (or CMB) interpreted as the far red shifted afterglow of the Big Bang. 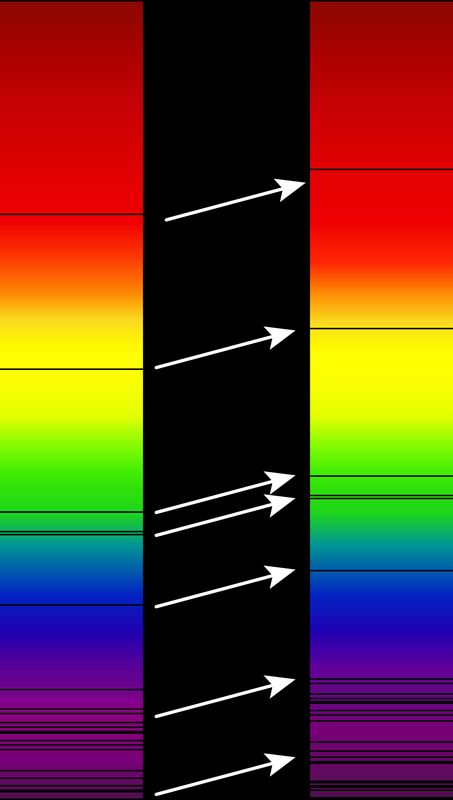 Redshift is really the shift of the dark absorption lines of elements to longer, redder, wavelengths. Hydrogen is usually used because of its abundance. Before discussing redshift to distance let me set the stage. It’s the 1920s. Before telescopes were powerful enough to see individual stars in other galaxies, our galaxy was assumed to be the entire universe and galaxies were assumed to be clouds of glowing gas called nebulae (meaning clouds) within our galaxy. We now estimate there are over 100 billion galaxies in the observable universe. Cepheid variable stars with the same variability period had been determined to be the same brightness everywhere, which made them a “standard candle” to determine distance, first in our galaxy and then in other galaxies. When individual stars were first seen in other galaxies, using the most powerful telescope of the time, nebulae were identified as other “island universes,” aka galaxies. Redshift of stars in our galaxy were determined to be caused by their speed moving away from us. The faster, the greater the redshift by the Doppler Effect, where light is “stretched” by the speed of the source. Redshifts in nebulae (nearby galaxies) were known to be greater than redshifts within our own galaxy. Edwin Hubble discovered the red shift to distance relationship for nearby galaxies, based on Cepheid variable stars within them. By this he calculated that farther is redder. Because the redshift from nearby stars in our galaxy had been recognized as indicating their speed away from us, this new redshift was assumed to mean speed of recession of galaxies. Hubble noted that the redshift to distance relationship was only linear if he assumed fixed, not receding galaxies. He was also uncomfortable with the extreme speeds calculated from redshift which were rapidly approaching the speed of light with increasing distance. His redshift to distance calculations resulted in very small universe with a “Big Bang” point of origin only 2 billion years ago, which is less than the calculated age of the earth at 4.5 billion years. Later adjustments extended it to 13.7 years ago, which is still only 3 times the age of the earth. He spent the rest of his life trying to convince others that they were wrong about redshift meaning speed of recession. Today’s redshift calculations exclude nearby galaxies as being affected by gravity of the Local Group of galaxies. A redshift of 1, as a simple ratio, is equal to the speed of light; we now have redshifts greater than 8. This made it necessary for cosmologists to assume that space itself between galaxies is expanding faster than the speed of light, the upper limit of speed for ordinary matter. Fritz Zwicky, a contemporary of Hubble, proposed that the red shift is from loss of energy by gravitational interaction over time that fits observations better than other non-speed related theories. To be a valid theory, the redshift must occur uniformly for the entire spectrum and not blur or obscure distant objects by scattering light. All theories based on repeated collisions in space do not fit these requirements. History rewritten: Modern cosmologists claim Zwicky’s theory was about collisions. His original paper discussed collision related theories and eliminated them in favor of gravitational influence over time and distance. More recently Steven Weinberg and others have raised speculation that mirrored Zwicky’s theory of gravitational influence over time causing red shifts, but they were not ready to abandon the expanding universe paradigm. “The frequency of light is also affected by the gravitational field of the universe, and it is neither useful nor strictly correct to interpret the frequency shifts of light…in terms of the special relativistic Doppler effect.” Steven Weinberg and Jaylant Narlikar and John Wheeler, quoted in “Galaxy Redshifts Reconsidered,” by Sten Odenwald and Rick Fienberg, Sky &Telescope, February 1993 issue. The Cosmic Microwave Background (CMB) is interpreted as the far red shifted afterglow of the Big Bang. However, the temperature of thinly dispersed matter in space as a result of residual starlight was earlier calculated and predicted by Guillaume, (5 K < T < 6 K),26 Eddington, (T = 3.1 K), Regener and Nernst, (T = 2.8 K), McKellar and Herzberg, (T = 2.3 K), Finlay-Freundlich and Max Born, (1.9 K < T < 6.0 K) based on a universe in dynamical equilibrium without expansion. Penzias and Wilson experimentally found the cosmic microwave background radiation to be consistent with a temperature of 2.7 K. Gamow, who had claimed to be the originator of the Big Bang Theory, also erroneously claimed he had been the first to predict the background temperature and claimed the result as evidence for the Big Bang. However, his estimate was not only not the first, but was 7 K with an upper limit of 50K. Did Einstein really say his cosmological constant (for a non-expanding universe) was his biggest mistake? The so-called Einstein quote that his cosmological constant was the “biggest blunder” of his life was only claimed by George Gamow in 1970, 15 years after Einstein died. Conclusion: If the universe is not expanding from a Big Bang, it can be far larger and much older than the Big Bang theory allows. The observable universe, observed back to approx. 13.5 billion years, may be a small corner of a much grander universe, which could allow more time for formation of galaxies and larger structures without the proposed dark matter influence. Exotic inventions such as expanding space, dark energy and dark matter may not be necessary. Recent work using near-infrared data from the Spitzer space telescope to more accurately estimate mass of numerous galaxies explains galaxy rotation speeds without resorting to exotic dark matter. Want to know more about this and other Modern Myths including climate change, evolution, origin of life or quantum physics? See related posts on this website or buy the book Perverted Truth Exposed: How Progressive Philosophy Has Corrupted Science in print or as e-book/Kindle on line at WND Superstore (the publisher) or at Amazon, Books-a-Million or Barnes & Noble . Did Hubble discover the Big Bang? Shortly after stars were first seen in galaxies, confirming that they are outside our galaxy, Edwin Hubble and others in 1929 discovered that the redshift of light from nearby galaxies was proportional to the distance as calculated from apparent brightness of Cepheid variable stars within the galaxies. This is called Hubble’s Law and the proportionality constant is the Hubble Constant. Because a redshift had been noted earlier in stars within our galaxy and had been attributed to movement of the source stars away from us, it was natural to assume, based on Hubble’s observations, that redshift of nearby galaxies was also caused by movement away from us. This phenomenon is known as the Doppler Effect and is attributed to the fact that each wave of light is emitted just a little farther away as the source recedes, thus “stretching” the light to longer (redder) wavelengths. Since farther is redder, farther must be faster by the Doppler Effect. Since galaxies are light years distant we are seeing them as they appeared in the past. Were the stars in the past moving faster than those in more recent times? At first it appeared to be so. Was the effect caused by the universe slowing down with time? If the expansion is slowing down, could it eventually stop and then start to contract? Instead, almost from the beginning, due to preconceived mathematically based theories postulating a beginning from a much smaller size, the redshift was seen as an expansion of the universe, not as contracting or slowing. But what could explain the acceleration into the past? After Einstein had defined space as being space-time, astronomers started to think of empty space as a thing the way the preceding generation talked about space filling aether. Some theoretical astronomers, i.e. cosmologists, decided that the space between galaxies was expanding making more distant objects only appear to be moving faster. (Like raisins on rising bread, all are moving at the same rate, but the expanding spaces between add up so that farther appears to be faster.) They never offered to explain the expansion of space; they just assumed it as a given. After redshifts were found that indicated speeds near the speed of light, Hubble doubted that recessional speed was responsible for the redshift of galaxies. In later years, he speculated about the intergalactic medium interacting with the light by gravitation or magnetism, etc. rather than expansion, as the cause of the redshift. He is credited with discovering the expanding universe and thus the Big Bang, but after his earlier work, he spent the rest of his life working to refute it. “A Relationship Between Distance and Radial Velocity Among Extra-Galactic Nebulae,” Edwin Hubble, Proceedings of the National Academy of Science, Vol. 15, 168, 1929.